"Choosing a locally owned store generates almost four times as much economic benefit for the surrounding region as shopping at a chain, a new study has concluded. The analysis also found that eating at a local restaurant produces more than twice the local economic impact of dining at a chain restaurant. The study found that the local retailers return an average of 52 percent of their revenue to the local economy, compared with just 14 percent for the chain retailers. Similarly, the local restaurants re-circulate an average of 79 percent of their revenue locally, compared to 30 percent for the chain eateries." We're going to have to update all of our promotional materials and talking points--when you spend your money locally, four times more of your dollars stay and support the community than if you were to spend those dollars at a chain or big box store! 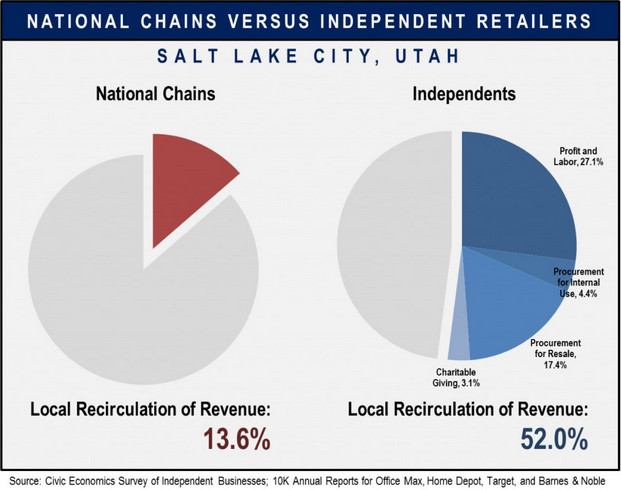 This study demonstrates that one thing is clear: it shouldn't be a tough decision to seek out locally-owned and independent businesses to patronize. The only difficult may be locating these businesses. Well, we try to make it easy for you! Visit our online directory of certified local businesses to search for exactly what you need.